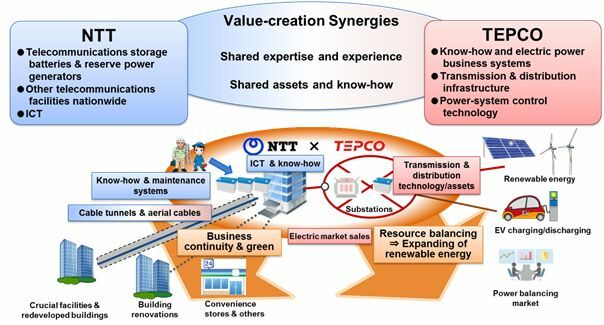 TOKYO, Apr 23, 2018 - (JCN Newswire) - Tokyo Electric Power Company Holdings, Inc. (TEPCO) and Nippon Telegraph and Telephone Corporation (NTT) have announced the launch of TNcross Corporation, a joint venture that will facilitate cross-industrial innovation by leveraging the two industry leaders' assets and know-how, including TEPCO's power-control technology and NTT's ICT expertise. The move is a business-diversity strategy, responding to changes in the electrical power sector, such as decarbonization, depopulation and the "Utility 3.0" democratization of electric power to promote the economic and environmental benefits of clean energy. TNcross will develop businesses that lead to the increased diffusion of renewable energy and the securing of external power supply for responding to emergencies. This will involve the effective utilization of NTT's telecommunications storage batteries and TEPCO's transmission and distribution facilities, and distributed power resources managed with advanced ICT. TNcross will develop direct-current (DC) transmission and distribution infrastructure and related energy services, such as high-efficiency regional DC grids connected to NTT telecommunications facilities. TNcross will create new basic services based on power-ICT resources that outside companies and municipalities will use to provide advanced services that meet changing needs in the market and society, such as Power-ICT related services necessary for smart cities. TEPCO CEO Tomoaki Kobayakawa said: "The electric power sector is facing a massive transformation due to a number of disruptive factors in the industry. By combining our respective infrastructures and know-how to meet these changes, TEPCO and NTT will develop meaningful services that benefit individuals, businesses and society as a whole." NTT CEO Hiroo Unoura said: "We are excited to be a partner of TEPCO, a giant electric power infrastructure company. This partnership will help NTT accelerate our strategy to utilize our assets and capabilities not only for supporting ICT infrastructure but also for solving social problems. Through this collaboration, we will create opportunities for service providers in various fields to deliver new value to end users. " TNcross will begin operating in July. NTT Group delivers advanced technology and innovative solutions in networking, software communications, and cloud computing that help transform businesses, governments and societies around the world. NTT Group will deliver convenient, enriched and reliable services to support customers as a "Value Partner" that its customers will continue to select. Today, 88% of Fortune 100 companies rely on NTT Group as their business partner. NTT Group generates over $105 billion in annual revenues, has over 240 data centers and employs more than 275,000 professionals working in 88 countries and regions. The company name uses initials from both companies (TEPCO, NTT) together with the word 'cross' which refers to the goal of meeting the eXpectation of customers and to provide them the added value of eXcitement while utilizing the eXpertise of both companies as they cross over.